The non-intrusive, explosionproof and permanently watertight design of the Rotork IQ has a proven record of long term reliability and low cost of ownership in the petrochemical industry. Secure non-intrusive and wireless technology is utilised for setting control parameters, commissioning and downloading integral dataloggers to provide vital diagnostic information for asset management programmes. The retrofit project at Izmit is being performed by Rotork’s well established agent in Turkey, Omas Teknik Pazarlama Temsilcilik. 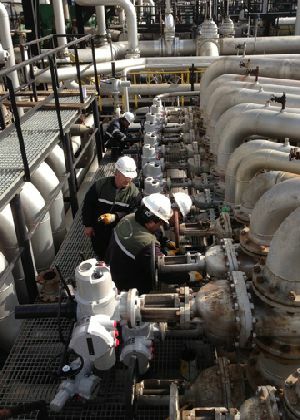 Omas’s responsibilities include the design and fabrication of valve adaptation, installing the new actuators, commissioning and on-site support. The new actuated valve packages are being assembled and tested in the Omas workshops prior to delivery to site. The expertise, experience and comprehensive facilities available from Omas at a local level are key components in the success of this major retrofit project. Due to the size of the refinery site, groups of IQ actuators in different areas will be monitored and controlled by a total of twenty Rotork Pakscan P3 digital bus networks. Designed specifically for valve actuation applications and the spacious environments associated with tank farm installations, Pakscan incorporates secure field communications with inbuilt network redundancy. Each network is controlled by a Pakscan P3 master station which provides a local centre for monitoring and control and links the network to the site’s SCADA system. The tank farm upgrade at Izmit is part of a massive modernisation and expansion programme at the Tupras refinery. This also includes the construction of new refinery facilities on an adjacent site by the Spanish company Técnicas Reunidas, for which more than 400 IQ electric actuators are being supplied through Rotork’s Spanish subsidiary company.